Each week on Football FanCast we will be celebrating those special breed who lit up the Premier League with their unique brand of utter genius. This time out we pay homage to a superstar elect who remained an enigma. Think about Derby County in relation to the Premier League and first thoughts lead to their constant striving to return to the top flight. Indeed it sometimes feels like the Rams are doomed to come close in perpetuity; the Sisyphus of the East Midlands. Following straight after that perhaps our memories turn to their dismal campaign in 2006 that saw Derby lodge the worse return in the competition’s history with just 11 points and a goal difference of minus 69. It is very hard to feel sympathy for Robbie Savage in any circumstances but here, captaining a side utterly depleted of quality who endured relegation as early as March, it is ever so nearly justified. It is a shame however that it’s these negatives that naturally arise because what should come to the fore is the Jim Smith side of the mid to late 90s: a terrific collection of talent forged from a solid base with the sublime Croatian Igor Stimac – a player who unquestionably deserves his own ‘Slice of Genius’ tribute further down the line – scheming at will. It is a team that played the ‘right way’ and did it well, establishing itself as a mid-table, thoroughly likeable outfit that could cause anyone problems on their day. And at the apex of this creation prowled an enigmatic, often exasperating, and occasionally brilliant striker by the name of Paulo Wanchope. The gangly Costa Rican arrived in England in March 1997, signed for a bargain £600,000 from CS Herediano. He came as an unknown proposition and this being the pre-YouTube days not even forum blaggers could pretend to know anything at all about him. Accommodation was found. He trained and got to know his new team-mates. Intrigue began to grow around him. Aged just 21 and with a playing style that half evoked a lithe middleweight and half Bambi on ice Smith was at pains to point out to the local press that what he had here was a real prospect but time would be needed for Wanchope to settle. So it was somewhat of a surprise to see his name on the starting eleven as Derby travelled to Old Trafford the following month to take on the reigning Premier League champions. 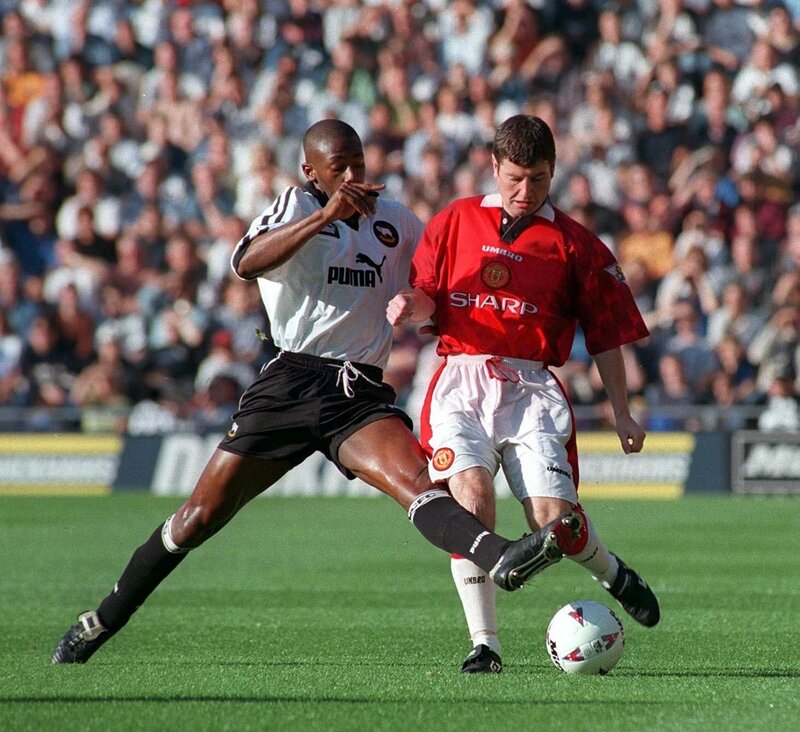 It turned out to be a debut for the ages with the tall forward knocking down a header at the far post for Ashley Ward to convert past Peter Schmeichel before venturing on a solo run from his own half that completely bamboozled the household names in red. It remains one of the most incredible goals scored in the modern era in the iconic stadium. At the break Derby went in two nil up and that would have warranted all the attention. Instead all anyone was talking about was the sensational introduction of a mysterious superstar elect and when County held on to triumph 3-2 that was when the hype really began. Just who the hell was this guy with the funny name and alien gait? And what might he become? In the event – barring a brilliant double against Arsenal six months later in another famous win – that was the best that it got and the best that we saw. 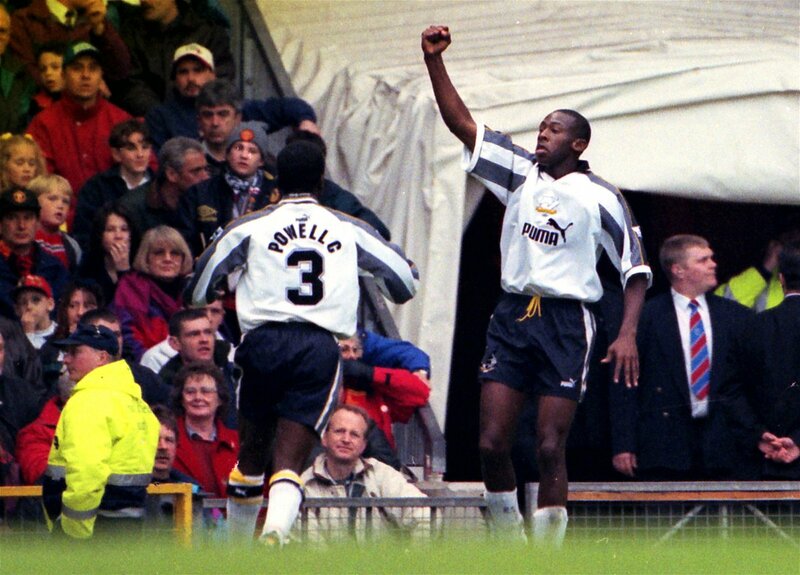 Yet that is not to suggest that Paulo Wanchope was a flash in the pan as his influential goals continued to steer Derby clear of relegation issues. A respectable thirteen goals in his first full season and nine thereafter is testimony to that. A subsequent move to West Ham proved to be largely successful despite the misgivings of a home support who railed against his inconsistency while a later spell at Manchester City was blighted by injury. By then we’d given up on the fanciful notion that individual, mazy acts of magnificence was in Wanchope’s locker. In actuality it was a one-off by means of a hello. But going back to that goal, what a weird and wonderful trip that was. And in hindsight it was not achieved via trickery, or deception, not even raw pace. As Wanchope received the ball Phil Neville drifted towards him, as if unsure whether to ask a stranger the time. Gary Pallister stands square on, thoroughly and understandably expecting a pass. Three others hone in the striker’s vicinity realising too late that suddenly he is on the edge of the penalty area with Schmeichel exposed. It was a goal created and scored through contempt for authority because nobody usually went for United’s throat with just a boot and a ball. Nobody previously dared. The silence of the Old Trafford crowd tells us everything. They’re stunned, questioning just who on earth this awkward, mesmerizing upstart was. Sadly none of us really got to find out.